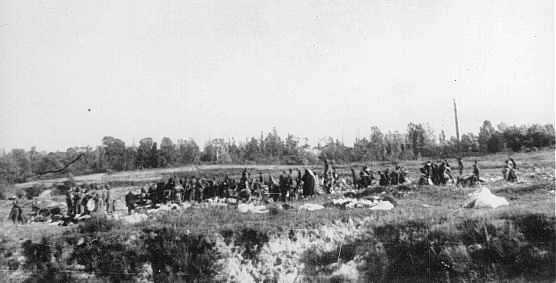 Question: Did you hear about Babi Yar? Fritzi: Yes. Not there. Not yet there. 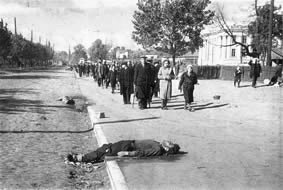 I heard about Babi Yar in Tashkent. It was quite a shock for me because, first of all, I didn't know where Babi Yar is. But they explained us. 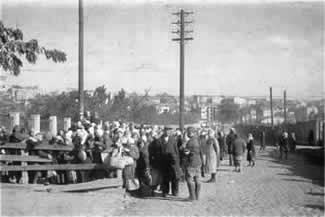 But my husband had a brother - my husband was from Bessarabia - came to our town. And his brother lived in Kiev because when Bessarabia became Romanian he run to the Soviets. You know, the young people run wherever they want. So my husband never knew this brother because he was born when his brother was probably seventeen, eighteen and run away from home. So then he caught up with his brother, the year the Russians were in our town he caught up with his brother. We didn't have money to buy train tickets. I don't know how we got - probably it was a possibility. And when we came to Kharkov, Kharkov was about to be occupied. So they didn't let men out, they let only women, so I went with his brother's wife, with three children, on a train over the Urals. Question: Just one thing, back to Tashkent. You said before that in Tashkent you heard about Babi Yar. Who told you about that? Question: They arrived after you? 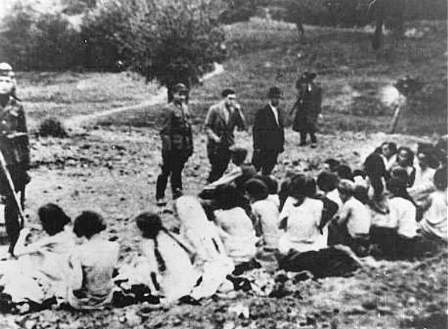 After the end of the Second World War Dina Pronicheva told how she escaped from the mass murder at the Babi Yar ravine, during September 1941, to the Soviet writer Anatoli Kuznetsov. 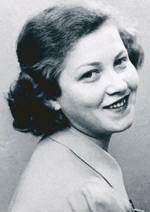 Kuznetsov published her story in Russia in 1966, and her moving story is recounted here. All around and beneath her she could hear strange submerged sounds, groaning, choking and sobbing: many of the people were not dead yet. The whole mass of bodies kept moving slightly as they settled down and were pressed tighter by the movements of the ones who were still living. Some soldiers came out on to the ledge and flashed their torches down on the bodies, firing bullets from their revolvers into any which appeared to be still living. But someone not far from Dina went on groaning as loud as before. Then she heard people walking near her, actually on the bodies. 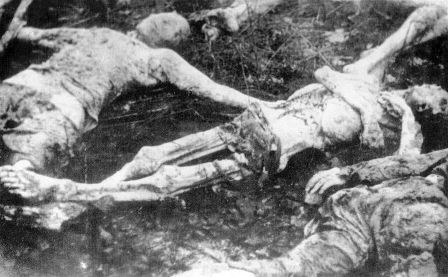 They were Germans who had climbed down and were bending over and taking things from the dead and occasionally firing those which showed signs of life. Among them was the policeman who had examined her papers and taken her bag, she recognised him by his voice. One SS-man caught his foot against Dina and her appearance aroused his suspicions. He shone his torch on her, picked her up and struck her with his fist. But she hung limp and gave no sign of life. He kicked her in the breast with his heavy boot and trod on her right hand so that the bones cracked, but he didn’t use his gun and went off, picking his way across the corpses. A few minutes later she heard a voice calling from above: “Demidenko! Come on start shovelling.” There was a clatter of spades and then heavy thuds as the earth and sand landed on the bodies, coming closer and closer until it started falling on Dina herself. Her whole body was buried under the sand but she did not move until it began to cover her mouth. She was lying face upwards, breathed in some sand and started to choke, and then, scarcely realising what she was doing, she started to struggle in a state of uncontrollable panic, quite prepared now to be shot rather than be buried alive. With her left hand, the good one, she started scraping the sand off herself, scarcely daring to breathe lest she should start coughing: she used what strength she had left to hold the cough back. She began to feel a little easier. Finally she got herself out from under the earth. The Ukrainian policemen up above were apparently tired after a hard day’s work, too lazy to shovel the earth in properly, and once they had scattered a little in they dropped their shovels and went away. Dina’s eyes were full of sand, it was pitch dark and there was the heavy smell of flesh from the mass of fresh corpses. Dina could just make out the nearest side of the sandpit and started slowly and carefully making her way across to it: then she stood up and started making little foot-holds in it with her left hand. 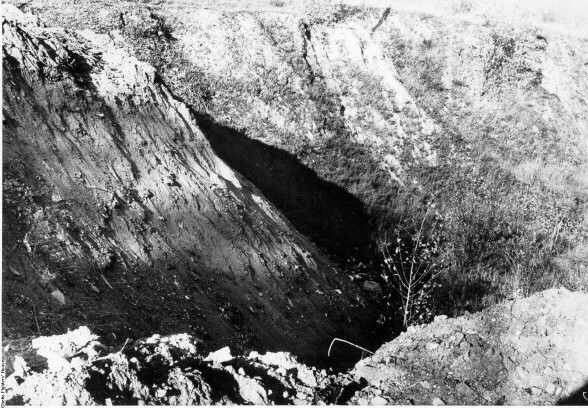 In that way, pressed close to the side of the pit, she made steps and so raised herself an inch at a time, likely at any moment to fall back into the pit. It was a small boy in vest and pants who had crawled out as she had done. He was trembling and shivering all over. “Quiet!” she hissed at him. “Crawl along behind me.” And they crawled away silently, without a sound. 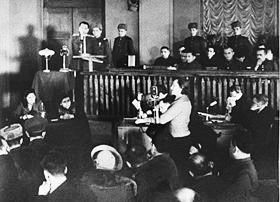 The Germans killed him on the spot, but not understanding what he said, she made good her escape. 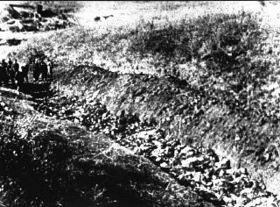 Over 33,000 Jews were murdered in the Babi Yar, one of the worst single massacres in the history of mankind.